Would you like to learn more about the Envira lightbox options? This tutorial will walk you through each option for your Lightbox settings. Let’s explore below all the options for all of Envira lightbox options. How can I get my images to open in the lightbox? Why aren’t my images linking on mobile? How can I get all of my caption to show in the lightbox? These options for your lightbox may seem very technical. If you’re unsure about any of the options, you can just leave the default settings that Envira creates for you when you first enable the Lightbox. Next, from the Lightbox tab you’ve several options. 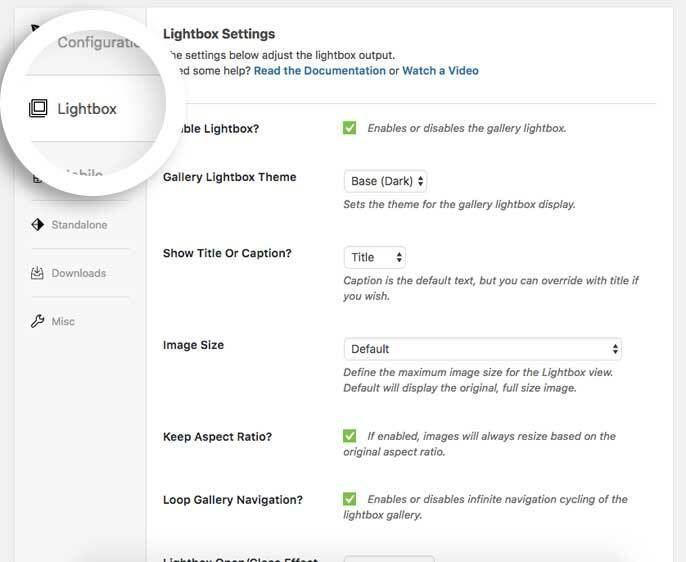 These options will change based on the Lightbox Theme you’ve selected for your gallery. Configure your lightbox options for your needs and based upon the addons you have installed through Envira. Finally we’ll need to configure your mobile lightbox options. 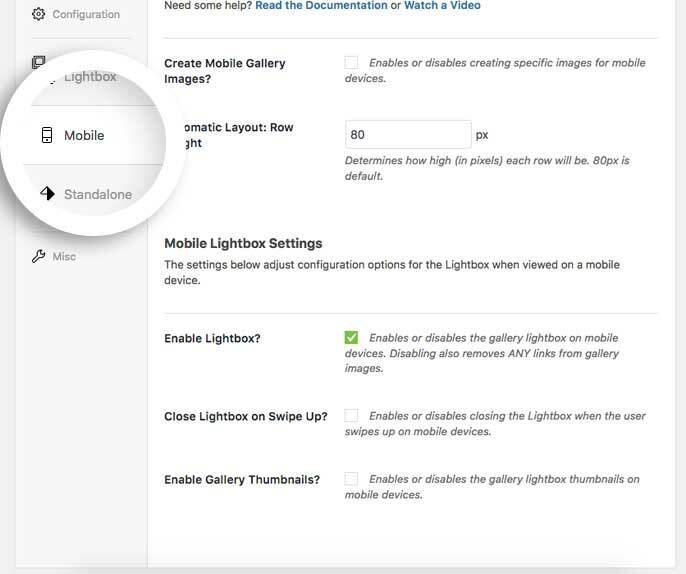 Navigate to the Mobile tab to set up your lightbox options on mobile devices. Enable Lightbox? – Enables or disables the gallery lightbox on mobile devices. Disabling also removes ANY links from gallery images. Close Lightbox on Swipe Up? – Enables or disables closing the Lightbox when the user swipes up on mobile devices. Enable Gallery Arrows? – Enables or disables the gallery lightbox navigation arrows on mobile devices. This won’t show if you’ve selected either of the Base lightbox themes. Enable Gallery Toolbar? – Enables or disables the gallery lightbox toolbar on mobile devices. This won’t show if you’ve selected either of the Base lightbox themes. Enable Gallery Thumbnails? – Enables or disables the gallery lightbox thumbnails on mobile devices. If you enable this, you’ll have further options to set your width and height. Once you’ve configured your Mobile lightbox settings, click Publish on your gallery and you’re all set! Want to see what else you can do on the Lightbox tab? 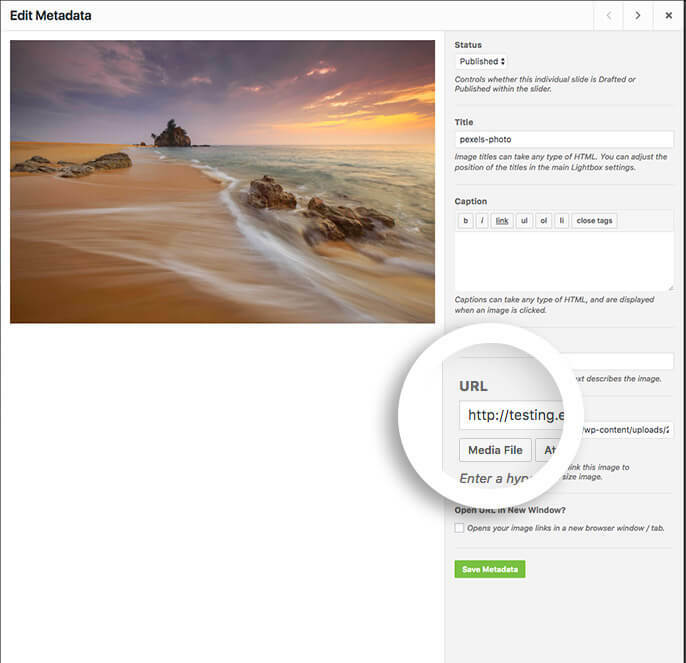 Check out our tutorial on Using External Links in Envira Gallery. Q: How can I get my images to open in the lightbox? A: Please edit the gallery and the select the blue pencil icon to edit image. On the Edit Metadata screen, verify you have a URL inside the URL field. If you want the image to link to itself, just select the Media File button, scroll down to click the Save Metadata and you’re all set. Q: Why aren’t my images linking on mobile? A: When you’re linking an image to any URL, please make sure you have enabled the lightbox from the Mobile tab or those links will not be included when the page loads. Just edit the gallery, go to the Mobile tab and check the box to Enable Lightbox? from the Mobile tab. Click Update on the gallery to save the changes. A: With either of the Base lightbox themes there is a limit to the caption length. For more information on this, read along with our tutorial.